After visiting Levain Bakery and Jacques Torres Chocolate, and purchasing an enormous bag of pastilles from the latter, I was inspired to try to create one of those enormous, soft on the inside, yet toasted on the outside cookies from Levaine. While at Jacques Torres, I noticed a sign next to the pastilles that described a recipe published in the New York Times a few years ago for a “Jacques Torres” chocolate chip cookie. When I returned home I looked it up online, anticipating whipping it up that afternoon. Unfortunately, the recipe calls for cake flour, bread flour, and 24 hours chilling time in the refrigerator. At the end of the day, I just didn’t have the stamina to leave the house to purchase bread flour and then try to jam trays of cookies in my teeny tiny fridge for the allotted time. Also, I needed to move fast because the bag of pastilles had been opened and they were disappearing at an alarming rate. 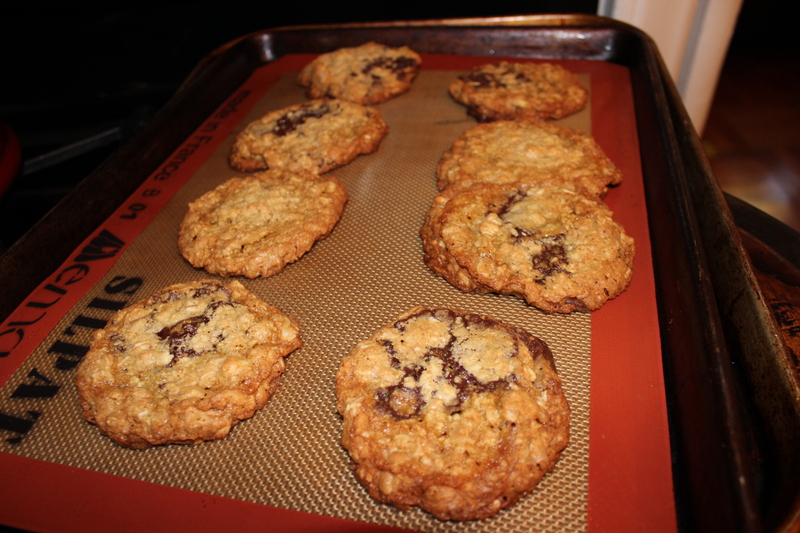 Instead, I decided to rely on my old favorite: Martha Stewart’s chocolate chip oatmeal cookies with walnuts. 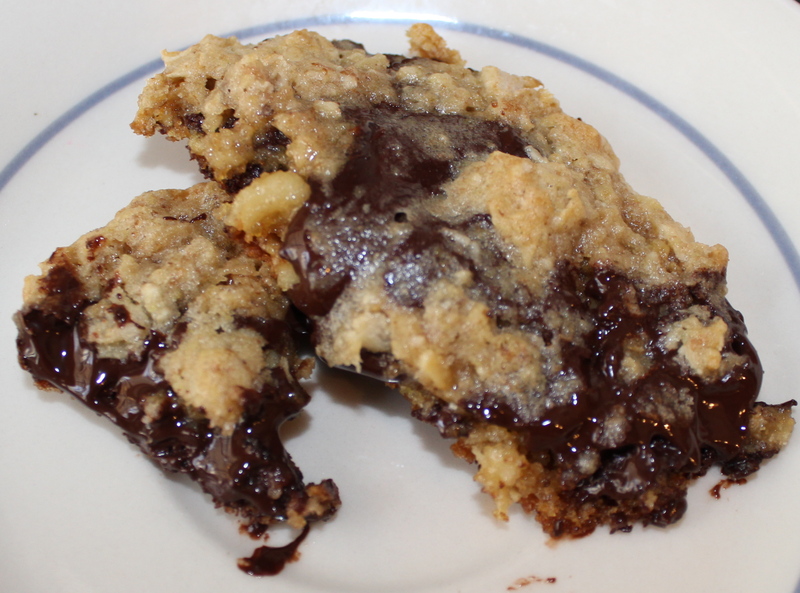 I used the pastilles in place of the chocolate chips and was rewarded with gooey cookies that were nonetheless a little too crispy on the bottom of edges. 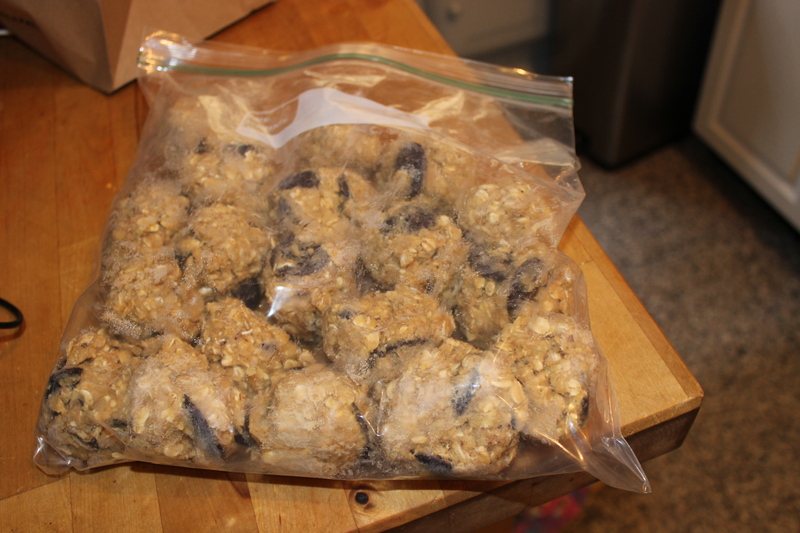 While eating four or five of those, I contemplated how I might achieve that Levain-like texture, and decided I would form the remaining dough into oversized balls, place them in a freezer-safe ziploc bag, and slide them in the freezer. A few days later I took a few out, lowered the cooking temperature by 25 degrees while adding about 5 minutes cook time and Eureka! I had a slightly crispy outer coating and an oozing chocolate core from those large pastilles. 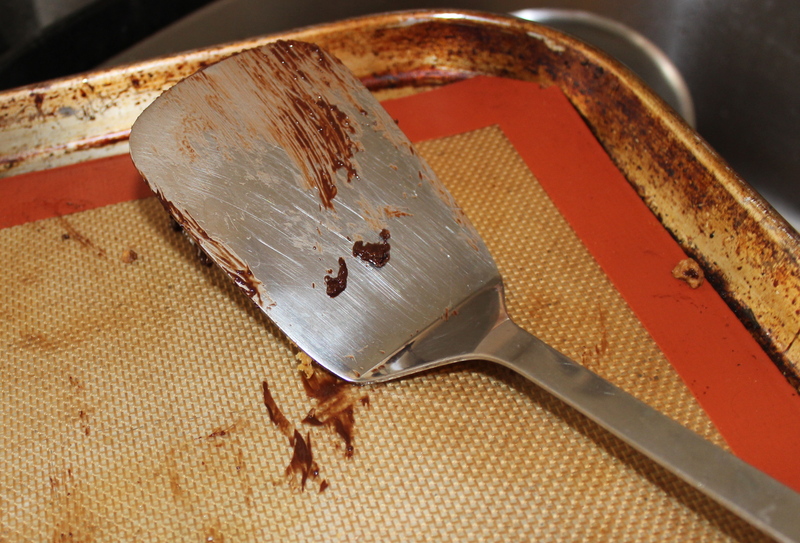 Even better, they were just oozing with chocolate on the inside, as evidenced by the spatula I used to transfer them to the cooling rack. (1) Heat oven to 325 degrees. 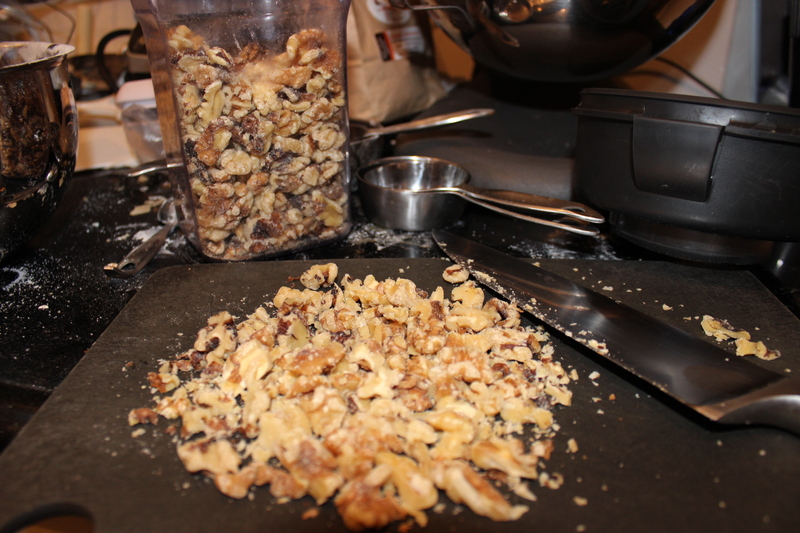 Combine the brown sugar, granulated sugar, and butter in an electric mixer fitted with a paddle attachment. Starting with the mixer on low speed and increasing until it is on medium, beat until the mixture is creamy and fluffy, about 5 minutes. 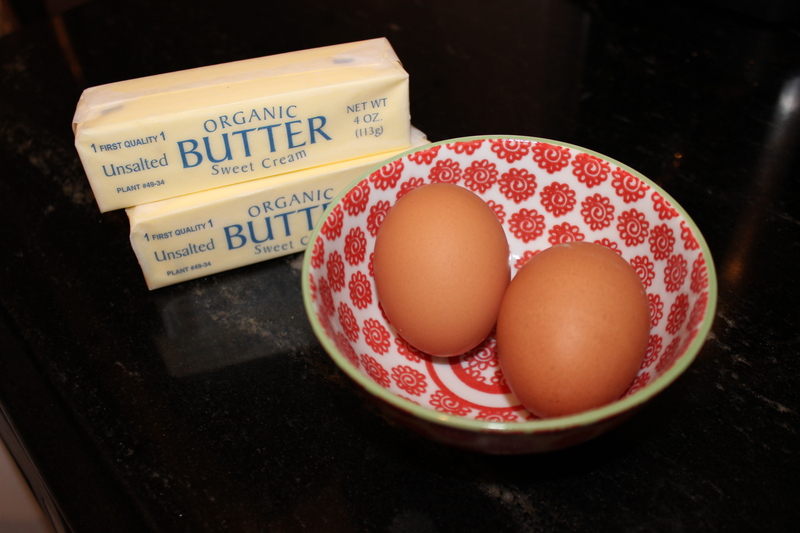 Add the eggs and vanilla extract, then scrape the sides of the bowl with a rubber spatula, and mix to combine. 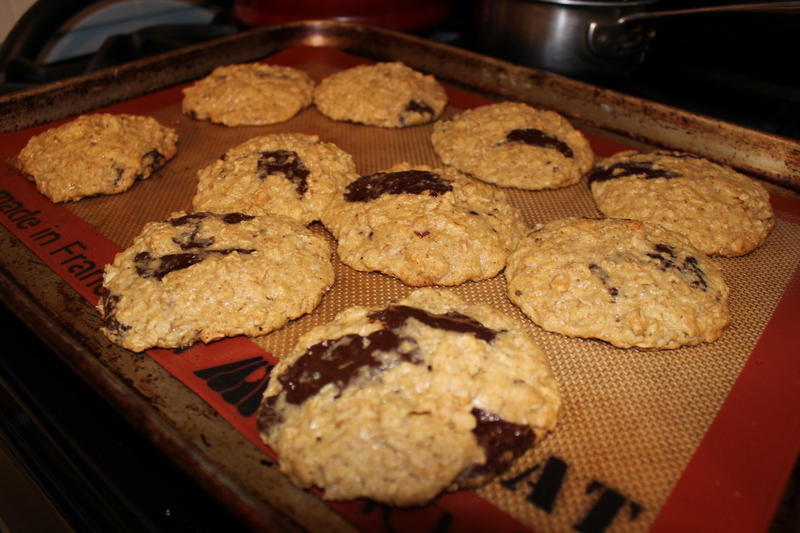 (2) Combine the rolled oats, flour, baking soda, baking powder, and wheat germ in a large bowl, and stir to combine. Add the dry mixture to the butter mixture, then mix on low speed just to combine, 10 to 15 seconds. 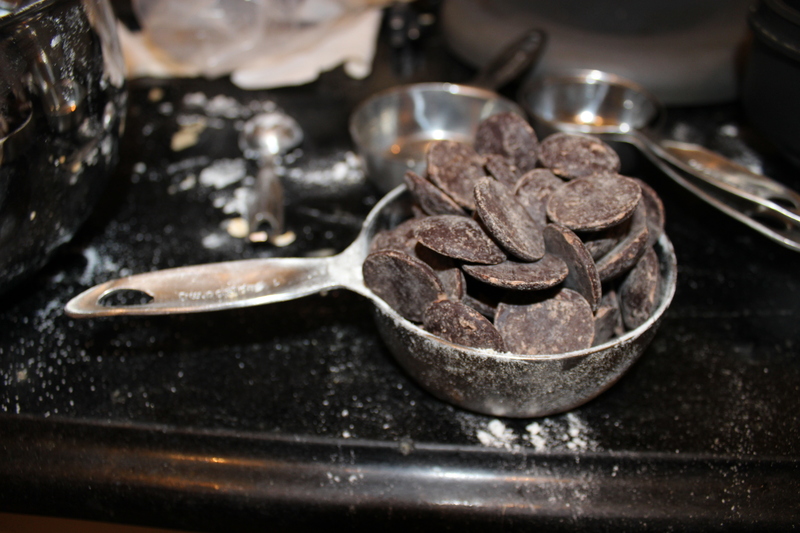 Remove the bowl from mixer stand and stir in chocolate chunks. (3) Line the baking sheet with parchment paper or silpat. 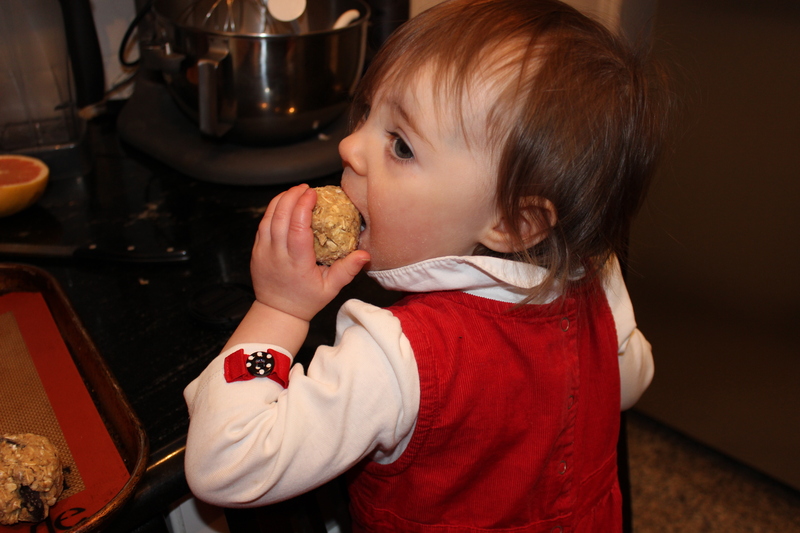 Use a large ice cream scoop to form balls of dough. Place the balls of dough about 4 inches apart on baking pans. Bake until golden and just set, about 18 minutes (or 22 minutes if frozen). Remove from oven. Let cool on pan 4 to 5 minutes before transferring to a cooling rack. Yummm – these look and sound amazing! Great pic of Jane! Ha, they were already all gone! Gotta make another batch soon.